Chevy Reveals Camaro ZL1 1LE! 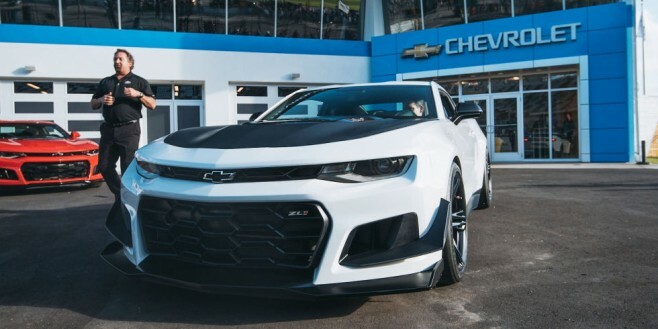 Woah, the Camaro ZL1 1LE has made a surprise debut today at Daytona International Speedway, just before this weekend’s running of the Daytona 500! The most obvious visual change between this and a standard ZL1 is the addition downforce-generating aerodynamic devices–there’s a giant rear wing, and big dive planes at the front. There’s also a new, larger front splitter and a larger grille opening to feed air into the engine. Arguably the most significant change for the ZL1 1LE, though, is with the suspension. Instead of the standard ZL1′s Magnetic Ride shocks, the ZL1 1LE gets Multimatic’s genius spool-valve dampers. These are the same sort of shocks used to astonishing effect in the old Camaro Z/28. Beyond the dampers, the ZL1 1LE gets additional suspension tweaks to make it stiffer than the standard car. The ZL1 1LE also gets new 19-inch forged alloy wheels wrapped in ultra-wide Goodyear Eagle F1 Supercar tires–305s at the front and 325s at the rear. All in all, these changes add up to a car that’s three seconds faster around GM’s proving ground than a standard ZL1.